Experience the best of China and Tibet. This custom-designed 16-day journey encompasses the breadth of China from the Himalayan “Rooftop of the World,” through the dramatic gorges of the Yangtze River and to the historic neighborhoods of Old Shanghai. Enjoy Five-Star accommodations in Beijing, Xi’an and Lhasa and in Shanghai’s historic Fairmont Peace Hotel. Cruise for three nights aboard the deluxe Victoria Jenna. Tour the impressive Three Gorges Dam. Walk along the Great Wall through Beijing’s Forbidden City and Tiananmen Square. 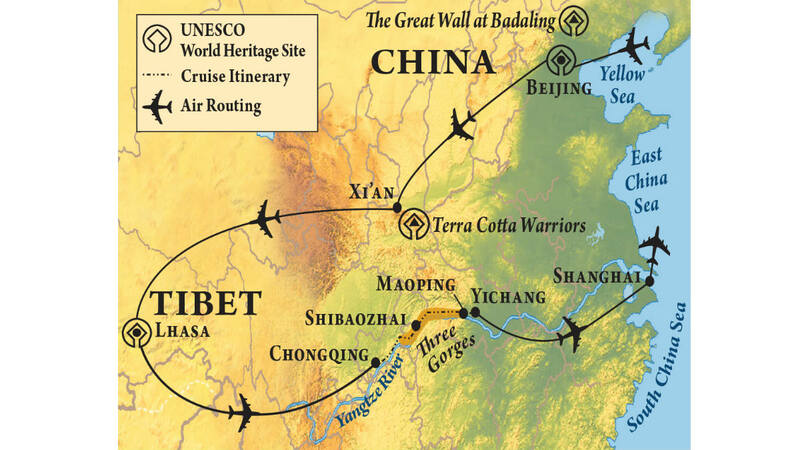 Visit ancient Xi’an and view the Terra Cotta Warriors. Explore Tibetan temples and Shanghai’s Bund and Pudong districts.